Would you rather put your paycheck in your crisper or your medicine cabinet? Of all the medicine created out of the Earth, food is the chief. - Sir Robert McCarrison, M.D. Becoming a health coach has been one of the most rewarding paths I’ve traveled in life. If you’re like me – you consider food our primary medicine and love helping others – it may be a career you are interested in pursuing yourself. People are always asking me how I became a health coach and whether it could be a viable career for them, so I thought I’d share a bit about my own journey. Before becoming a health coach, I owned a gardening business I loved (gardening is still one of my favorite hobbies). But a series of cumulative back injuries caught up with me, and despite many years of complementary therapies to address my injuries, I relented and had back surgery. I’m happy to report my surgery was a huge success, but my neurosurgeon warned that the repetitive stress of gardening professionally might not be the best long-term strategy for the health of my back. In a memorable heart-to-heart conversation post-surgery he urged me to seek out a new career built on one of my other passions that could fill me up as much as gardening did. So that’s what I did. I’ve loved “holistic nutrition” since I was a teenager and discovered how significantly the food I ate impacted my health. Nutrition had become a hobby of mine (nerd alert! ), and I already had my favorite “food gurus,” including Dr. Andrew Weil, Sally Fallon, Deepak Chopra, Dr. Joseph Mercola, and Dr. Christianne Northrup – the “mavericks” of the day. I definitely wasn’t drawn to just any old garden-variety nutrition program, especially those mainstream curriculums funded by companies like Coca-Cola or Nestle that were still teaching people fat was a harmful macronutrient or that artificial sweeteners were the healthiest choice for diabetics. “Holistic nutrition” was what I wanted to study, and when I searched for schools offering curriculums that jived with my ideas and values, I found only three schools that met my criteria. 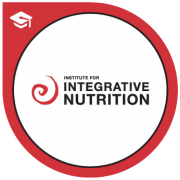 The Institute for Integrative Nutrition was one of them. After receiving IIN’s catalog in the mail and seeing how many of my nutrition gurus were part of the faculty, I knew within 10 minutes I would be pursuing their health coaching program, which meant I would be flying back and forth to New York City once a month. Every bone in my body knew it was the perfect program for me, and it turns out I loved every minute of my education with IIN. I haven’t looked back since. Today I have a thriving health coaching practice and feel so blessed I found a career that allows me to be and express myself so naturally. If you are on the hunt for a rewarding career or feel as if you already are a health coach at heart, I urge you to pursue your passions and dreams. Life is too short to spend our days in ill-fitting, unrewarding jobs, and the world is still in desperate need of health mentors. I love talking about my work and my education at the Institute for Integrative Nutrition. If you would like to learn more, simply email me and we can set up a time to talk. I’m always happy to share more about my journey. Best wishes to you!